How to Make Your PC not Fall into sleep? 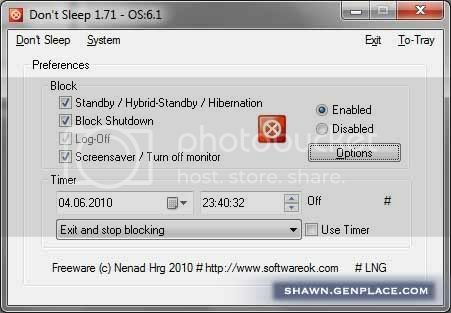 Don’t Sleep is A tiny portable program for your window to prevent System shutdown, loggin off the computer, Standby, deactivation of the monitor, activation of the screen saver, Hibernate, Turn Off or Restart. Secondly, it is a portable program that can be executed directly from your thumb drive or desktop. However, the advantage of this program is to save your time instead of manually disable all the options and active again in the windows setting. Furthermore, it allows to time control unblock, or shutdown the computer for a specified time.